I was flabbergasted with the press’s reaction to this wine. Early on I think I developed a bit of winemakers’ bias against it. First off, it wasn’t easy to make. After getting over the difficulties of making it, I found this wine so obvious and delicious from the barrel that I assumed it didn’t have the stuffing to turn into something really special. It was only a few weeks ago, when I had a conversation with a wacko Belgian wine guy I know, that I began to take this wine seriously. He is the kind of person who is altogether too happy to tell me how bad a wine I have made and or how un-price worthy it is compared to what you can find in (the old) Europe (or even in the new Europe, which is, as far as I can tell, Bulgaria and Spain). He is certainly not one to give idle compliments. Therefore, at first I thought he was teasing me when he said he had served this wine to a group of serious French winemakers who had raved about the wine, but he wasn’t. Our 1999 and 2001, which I had him taste along with the 2000, are rather bigger, more tannic wines that–for him–are out of balance. (I think they are even better, though in need of some more bottle age.) However, I can now see the beauty of the 2000. The wine is definitely easy to enjoy today, but what it possesses is harmony that is uncommon for new world pinot noir. 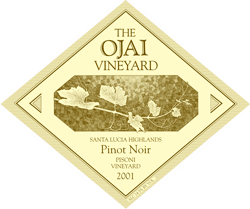 The aromas are of pretty, beguiling pinot fruit and not of oak, and the flavors are silky and rich, yet have the proper bite in the finish to give the wine length. This experience of having someone whose palate I respect tell me something new about a wine I crafted made me realize once more that wine tasting is not about objective analysis. It is emotional and subjective. It is as easy to fool yourself into believing a bad wine is good as it is to imagine the opposite.